As a companion to our Resort sheeting, Aura is every bit as worthy of the luminaries and dignitaries that frequent the finest hotels in the world. Its sumptuous combed cotton terry wraps you in softness, while a colorful striped border, woven as if embroidered, adds an air of whimsy to its impeccable design. Wash cloth of combed cotton. 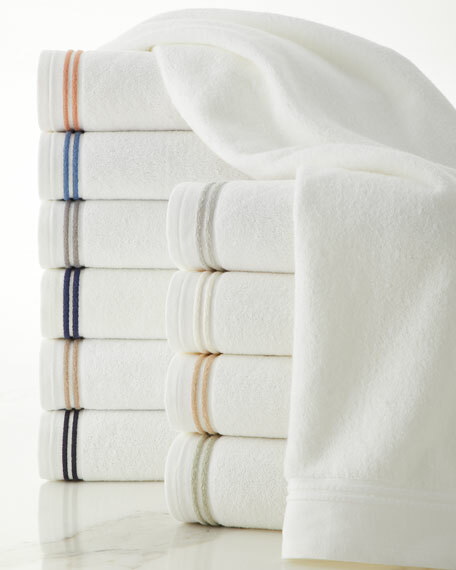 Bath towel of combed cotton. Bath sheet of combed cotton. Hand towel of combed cotton.